Experience your Self through meditation and sound. We begin with light yoga and breathwork, to warm up the body and calm the mind as preparation for a seated guided meditation. 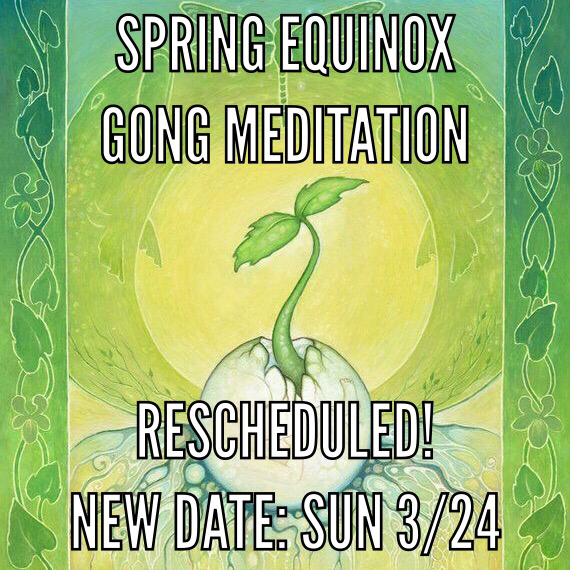 We will end with a Neptune planetary gong sound healing while integrating in a lengthy savasana relaxation pose. The powerful healing vibrations of the gong are very cleansing, moving through the body, psyche and energy field to move stagnation and emotional blockages, promoting rejuvenation, transformation and inspiration. The gong is a dynamic experience that varies greatly from event to event and person to person. Please bring any blankets or pillows you need to feel comfortable during the 40 minute gong bath. There are yoga mats available to borrow if you do not have your own. Space is VERY limited - only 8 spots available, so register today! To be alerted when a new event has been scheduled, join the Sacred Vibrations mailing list.